The composition aims to amp up the tropical floral genre by making it smell fearless and latex-y, hinting at sensorial extremes with its nature-inspired tropical note of rubber, which goes unmentioned by the brand. This rubber note conveys both authenticity and urbanity. It is used here to play on dissonance, but the mind at the same time quickly approves of its relevance to the eco-system it makes us believe it originates from. Orchid Soleil also introduces a subtle gourmand theme which is never as thick and heavy as a pudding or cake but nevertheless at the level of perception of lightly fragrant sticky rice or fragrant riz au lait. It smells a bit of Pandan leaves scent too, which is actually the analytically correct aroma of so-called « jasmine rice » thanks to the predominance of molecule 2-acetyl-1-pyrroline. Its odor profile has been compared to pop-corn, which might explain why some American customers discern a « tortilla » scent in this perfume - and are turned off by it. We think it's more likely due to an attempt at translating fragrant Thai jasmine rice as a perfumery accord - also not discussed by the label. After these tropical fireworks, the perfume slows down taking on subtle, interesting woodsy nuances which can easily be interpreted as feeling muggy and jungley while a drizzle of citrus peps up the scent. What it feels like too however is that the change of regimen from the explosive overture to its subsequent stage is overly contrasted, to the detriment of the perception of the ensuing development, which is quite linear - except for a an upcoming olfactory surprise. Those woodsy nuances tagged as tropical which evoke smoky bamboo shoots filled with fragrant jasminey sticky rice and coconut are great but lack a sense of transition. The structure of the scent feels too dual but more importantly wonky. Once you get over this absence of a graceful olfactory bridge to a different mood however, the now sotto-voce operating perfume reveals a certain depth but remains linear in its focus on this slightly gourmand accord blending braised bamboo shoots, coconut jasmine rice and rubbery orchids. The press materials refer to « chestnut cream » but until we read about this detail, we did not think about it. Afterwards, yes, it's a possibility. While salicylates would be expected in an orchid fragrance, and a solar one at that, it is apparently the dosage which can add this unexpected piercing facet to a big tropical blooming perfume. To the nose, it smells like aldehydes and certainly behaves like them, except for the fact that they do not appear in the top, adding a slight retro, 1950s Hollywood vibe to the composition. You can imagine ladies in corolla skirts, white gloves and patent leather bags wearing this type of both lush and prim perfume. This style would be in sync with Tom Ford's sensibilities and inspiration board, both as a perfume-developer and director. In Orchid Soleil, two extremes meet: the coolness of aldehydes and highly-concentrated salicylates, and the tropical lushness of femme-fatale flowers like tuberose, gardenia, orchid, red lily, and the fruit of an orchid, vanilla. It's a statement fragrance. It's glamorous. It hints at the past. It's very Tom Ford. It also makes the point that you can name notes but that in the end, abstraction wins. Your imagination is flying on a spectrum of sensations which plays on the themes of the Tropics, gourmand, white florals and aldehydes, and/or salicylates. 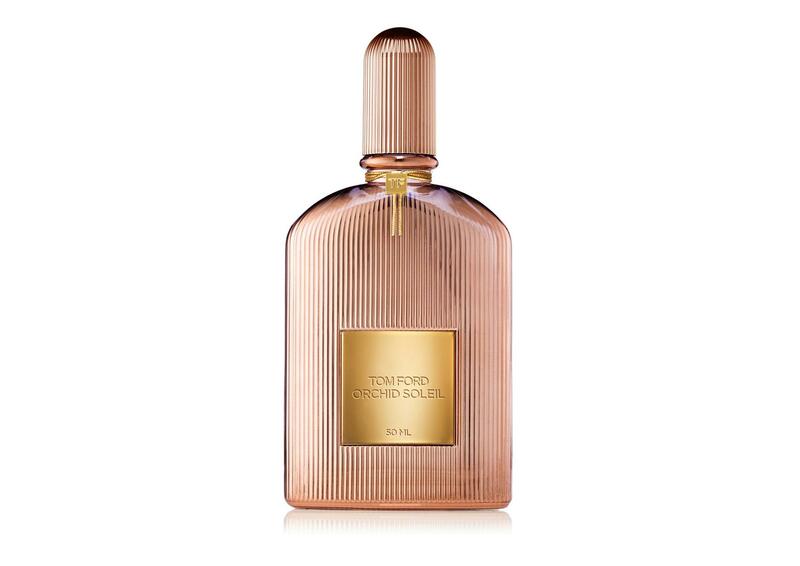 Notes : Bigarade, pink peppercorn, cypress, tuberose petals, Tom Ford's black orchid, red lily, cashmere, amber, patchouli, vanilla, chestnut cream.